About Product : The bags curated in this collection are earnest expressions of a Maldhari lifestyle, with each piece uniquely narrating a small story about their farming practices, homes and daily activities. 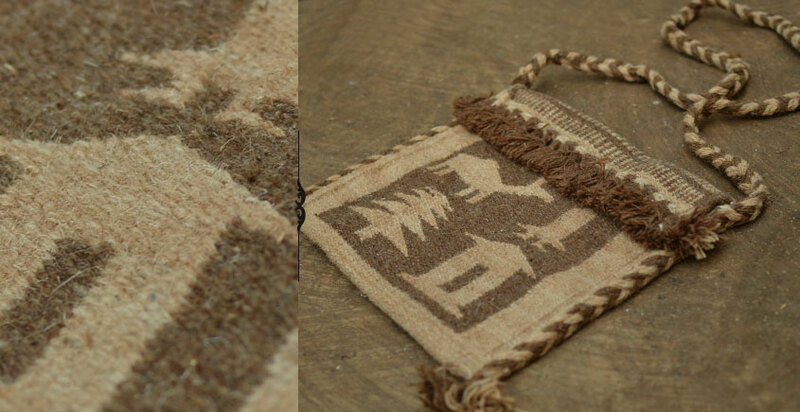 These exquisite and sturdy sheep wool carryalls are handspun and hand woven on traditional looms and are a new age derivative of the ancient camel belts. To finish these masterpieces in a characteristic way, they have been equipped with hand braided woolen slings long enough to around your body comfortably. Ever been to a music concert? …. Well the one that plays in the houses of Bhujodi is a wee bit different, not just in what you hear but also in the instruments that play. The musicians of Bhujodi play on … from morning to dusk, meditatively. Their orchestra constitutes of spin wheels for strings, wooden loom for beats, and for vocals there are chirping birds, sojourning the mud ledges for grains and water, offsprings giggling and playing pee-ka-boo across the courtyard, Mooing cow in the corner and almost certainly, filling the background will be either the folk tunes or the old bollywood melodies. All of this manifesting into a concert, not just ears get accustomed to, but hands follow too. Meditatively weaving motifs out of a deeper conscience we call genetic inheritance. Each woven fabric carries with it, millions of such consciences, intertwined with the warp and the weft, closely put together to form the fabric of life. The basic structure of the loom remained the same, but it evolved to a more convenient model with time. The one in use today has the shuttle movement controlled by a foot-over pedal, as against the slow process of passing it through the warp manually. The fabric got finer with speed and variety of yarns available. 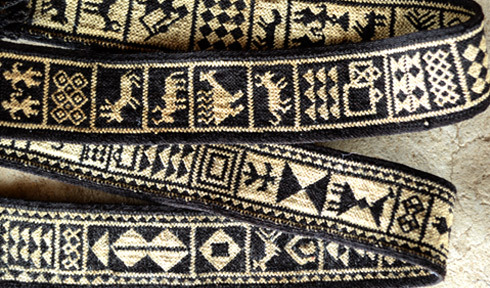 The motifs however remained traditional and characteristic of communities. Like wheel, weaving is an invention that revolutionized the way we saw life there after, the basics holding valid till date. While some wool from locally grown sheep is still used, they also procure silk from Bangalore, acrylic from Ludhiana, wool from Badmere and cotton from various places, to cater to the increasing demands. 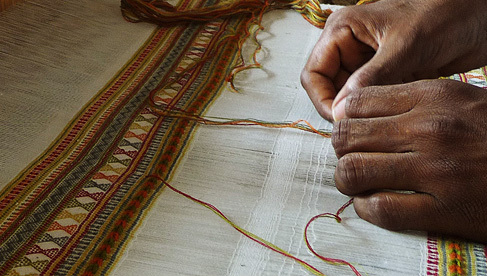 The fine cotton has enabled them to create more intricate and colorful designs. Such pieces may have 70 threads per square inch instead of the usual 24. Weaving of a piece may take days to months, depending upon the intricacy and newness of the design. The yarn in its raw form is soft, breakable and capable of getting entangled easily. To get rid of these properties, a thin paste of wheat flour with water is boiled and the bunch of woolen strands is soaked in it. Soon after sun drying it in the fields, a layer of the paste covers the strands. These are then separated by combing them apart with a brush. 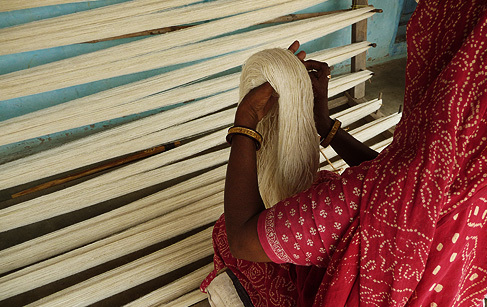 This bunch of strong strands is then taken inside the house, where several people are engaged in different stages of the weaving process. Some are busy cranking a machine that spins the thread onto a spindle, preparing the weft. 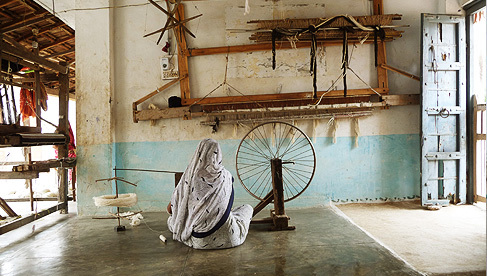 A woman is working at high-speed to prepare the warp thread on a wooden frame called ‘chaukhta’. In the corner, a man is weaving on a shuttle loom. Vankaar Mosi Belji explained that, through the means of division of labor, it’s the men who sit on the loom as it needs a lot of stamina, while women take care of the auxiliary processes like making yarn on the charkha, laying it on the loom and adding value to the woven articles. Inside his room, carpets, shawls, stoles and placemats were neatly piled. 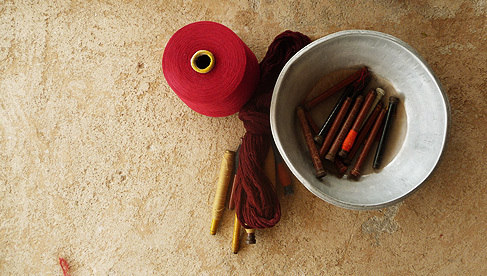 Some had bright colors others dark, and still others retained the natural color of the fibers. Many of them contained small round mirrors that were so naturally into the woven design. 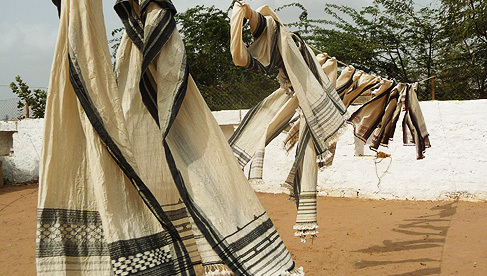 Apart from Bhujodi, Vannora, Kota, Jamthara, Sarli, Bhuj, Kadarthi are other villages in Kutch region where weaving happens. Weaving as a process goes around the year apart from the rainy season, when work hits a lean because of practical reasons. Not relying too much on today’s education system, the vankars train their future weavers from a very tender age. Growing around the traditional looms in the household, the kids learn by seeing, even before they develop conscience. 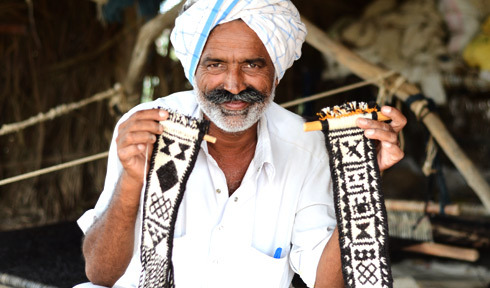 About Craftsman Tejsibhai Marwada is associated with weaving since childhood. Note The product is hand woven; gentle hand-wash or dry clean is recommended. Reshape and flat dry while it is damp.